Hubble sees distant galaxies: group of seven galaxies at the edge of the Universe. An incredibly deep image taken by Hubble Space Telescope has made an amazing discovery: a group of seven galaxies that existed just after the Big Bang itself! One of them may be the most distant galaxy ever seen, a soul-crushing 13.3 billion light years away, and seen as it existed just 380 million years after the Universe itself was born. Hubble’s Ultra Deep Field, with the extremely distant galaxies marked. The most distant is 13.3 billion light years away. Click to embiggen, or grab the very high resolution version. The image is a result of 100 hours of Hubble staring at one spot in the sky. They chose the location of the previously-observed Hubble Ultra Deep Field (HUDF), a region of the sky where Hubble had already taken a very long look, taking a census of thousands of galaxies at all different distances. This new observation, though, looked in the infrared, where we expect the most distant galaxies to shine most brightly. The picture above shows the HUDF. The locations of the seven extremely distant galaxies are indicated by colored diamonds; a close-up of each one is shown on top (click the image to get a high-res version). The number listed with each galaxy is a measure of its distance using its redshift: Because the Universe is expanding, more distant galaxies appear to move away from us faster than nearby ones. That can be used (with some fairly complex physics) to determine the distance to each galaxy. I explain this technique in more detail in an earlier post about redshifts. The redshift is noted by the letter z, and the bigger the number, the farther the galaxy. A z of 8.6 is a galaxy about 13 billion light years away. The most distant galaxy seen was at a redshift of 11.9, which means the light we see from it left a whopping 13.3+ billion years ago. Since the Universe is 13.7 billion years old, this means we are seeing this galaxy as it was only about 380 million years after the Big Bang. That’s a stunning observation. Let me be clear: These distances are not confirmed. They should be pretty solid, though. The only way to be sure is to take a spectrum of each galaxy, breaking its light up into thousands of different wavelengths (colors) and carefully analyzing them. For this new discovery, astronomers examined the light of each galaxy using different filters instead, which is quite accurate, but not exact. I’ve used this method myself, and it’s pretty good, so I suspect these numbers will hold up. The reason this observation is important is that we know very little about what galaxies were like so far back in time. Galaxies like our Milky Way are big, sedate, and fully-formed, but that wasn’t always the case. When the Universe was only a few hundred million years old, there were no galaxies; they were just starting to form. The first stars forming from vast clouds of gas would, we think, be extremely massive—well over 100 times more massive than the Sun—and very hot. They would’ve flooded the Universe with ultraviolet light, making the surrounding gas glow at a very specific color in the UV. These baby pictures of the seven galaxies tell us what those conditions were like back then, including potentially how many of these ginormous stars existed at the time. 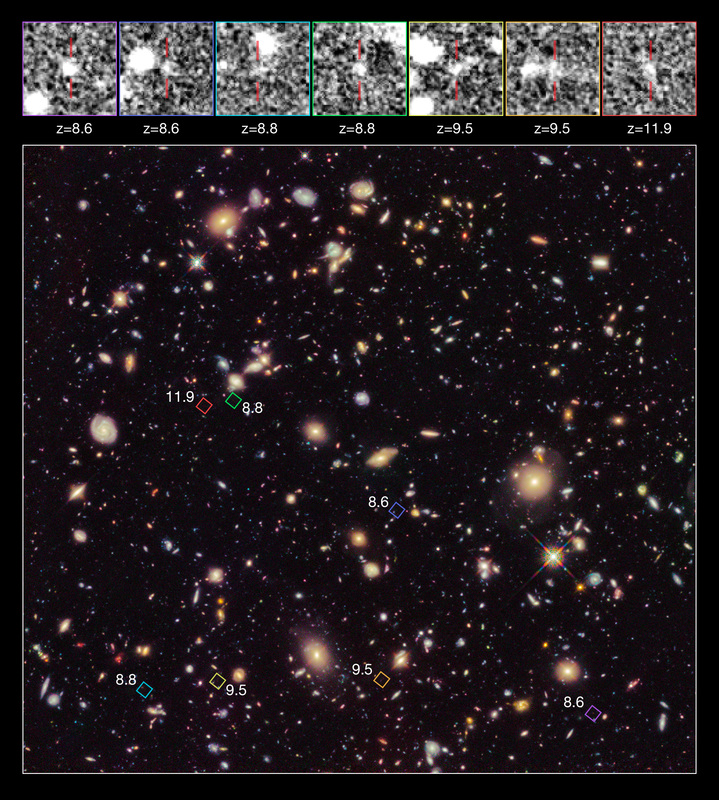 Closeup of some of the distant galaxies seen in the Hubble Ultra Deep Field. They are much easier to see in the higher-resolution version of this image. One big result is that it looks like these stars didn’t suddenly all turn on at once everywhere, but instead this took some time to unfold. Galaxies grew rather slowly, and stars formed at different times. 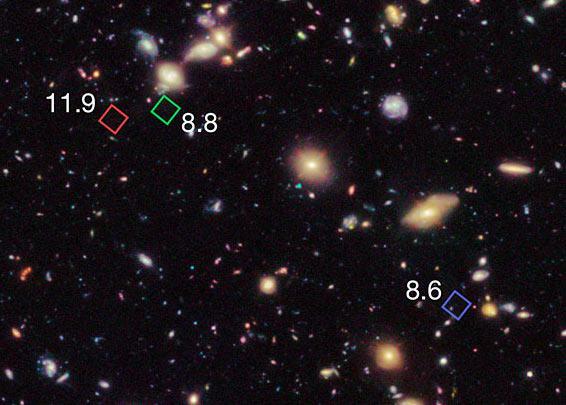 Interestingly, that farthest galaxy may be not just the most distant galaxy Hubble has seen, but the most distant one it can see. Even cooler, this baby galaxy appears to have been already chugging along, clearly born some time even earlier than we see it here. It seems likely that with a bigger telescope that has sharper vision in the infrared, we’ll see many more of these galaxies, and a handful even farther away (and therefore younger). Mind you, Hubble was pointed at what was essentially an “empty” region of the sky, chosen specifically because it was boring, lacking previously visible objects. But with Hubble’s sharp, sensitive vision, thousands of galaxies billions of light years away appear, and when it’s seriously focused on one spot it can see all the way to the thin hairy edge of the Universe. And yet even this isn’t all we can do. With James Webb Space Telescope, due for launch in a few years, we’ll do even better. It has a bigger mirror, more sophisticated cameras, and is tuned specifically to look in the infrared. This little tribe of baby galaxies is just the first taste of what’s to come.